Owned with Schuman Stock Farm, Verona, ND. 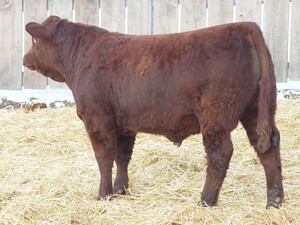 REDROCK was the $8500 top selling red bull of our 2006 sale. This well-balanced bull offers thickness, fleshing ability, capacity, structural correctness and great disposition blended with the power of one of our top cow families. His dam is also the grandmother of MAC ROBINHOOD 247R, the 2007 National Champion Optimizer bull. First calves by REDROCK show outstanding potential with tremendous thickness and performance.